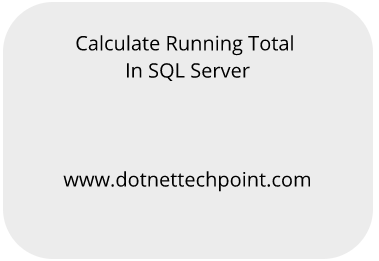 In this article we will talk about how to calculate running total in SQL SERVER. Now a day it is very tricky question asked by interviewer for experienced or fresher. Now create a table, query for create a data table. Now press F5 for execute this query, after execute this query Employee table is created successfully. Now insert records in this (Employee) table. Select above query and execute it. It means all these records are inserted in Employee table which you can see. Now come on the point for Calculate Running Total. Question: What do you mean by Calculate Running Total? 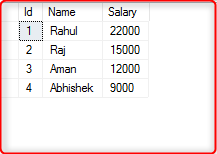 Answer: In Employee table there are only 3 columns (Id, Name, Salary) add one extra column (which is Running Total) and this column contains values for Rahul 22000 but it contains Running Total for Raj 37000 ( Rahul + Raj ) in this series for Aman 49000(37000+12000) etc. Now implement this logic in SQL Server, query for it. If you want to take it power point slide then download it from github. Conclusion: In this article we saw that how to calculate running total in Sql server in easy way.